As the annual pilgrimage of the “Firehole Rangers” (as I refer to us) nears and anticipation builds, I find myself easily distracted from daily tasks. This happens every year, without fail. Consistency–that’s what the trip represents. Every year on the Friday before Memorial Day, a rag-tag assembly of mostly the same group of guys departs the wet side of Washington for the 12+ hour drive to West Yellowstone, MT. We always stop at the same place for breakfast, for gas, for pit stops along the way. We always stay at the lavish accommodations of the Ho Hum Motel in West Yellowstone, purchase our National Park fishing permits at the same shop, and we always (always) purchase the same secret weapon soft hackle flies. There’s very little deviation. Creatures of habit the Rangers are. On Saturday morning we’re always up early and one of the first cars through the gate. Fishing inside the park opens on this Saturday, and we drive as quickly as legally possible (and circumstantially feasible) to our destination: Midway Geyser Basin. Usually a herd of bison cows with their recently-birthed calves impedes our progress, but that’s just part of the ritual and one of the benefits of being in Yellowstone, where the wildlife rule. They’re never in a hurry, nor should we be. As hard as it is to control our enthusiasm to get on the water, the meandering Tatonka are a good reminder to slow down and take it all in. If you don’t you’ll miss all that Yellowstone has to offer. In addition to more bison than you can shake a stick at, we also see herds of elk along the drive. One year a grizzly was seen loping along a ridge that runs parallel to the road. But it’s not a race to get to the river. Some years we’re the first anglers on the water; other years that’s not the case. It matters little because everything about this trip is an experience to be savored. I can imagine no other place on Earth quite like this, where two-and four-legged animals can peacefully coexist in such close proximity. However, the annual tragic encounter between a tourist and a native park inhabitant serves as a good reminder that these animals are very much wild and should be respected as such. Each year we see tourists ignoring the warning signs and getting way too close to the animals. I’m led to believe that the occasional culling of the human herd is a undoubtedly a good thing. Yellowstone is big country. There’s room for everyone (animals and anglers). There are sizable crowds of tourists on Memorial Day weekend, although much less so than later in the tourist season. Relatively few people are in the park to fish while we’re there, so while I’ve heard that Firehole can become crowded with anglers, we’re fortunate that we see far more animals than fishermen when we visit. We always fish the same stretch of the Firehole river the first day and we always catch a lot of fish. Even on years when the river is higher than average, the Firehole produces enough cookie cutter-sized browns and rainbows in the 7-12 inch range to keep a bend in the 4 weight and a smile on the face all day long. There’s always that chance of a bigger fish that keeps an angler working a deep hole persistently. Stare at the river too long and you’re likely to find yourself flanked by bison when you finally look up. If ever a river represented the essence that ‘there’s more to fishing than catching fish’, the Firehole would be it. As the river winds through the Midway Geyser Basin it changes personality with regularity: long, slow stretches filled with thick weed beds yield brown trout. These fish hit the fly hard and put their heads down. It’s not often they show themselves above the surface, though I did have a brown go airborn last year. Where the slow water turns to riffles, the trout become hard-fighting rainbows that will put on an aerobatic show once hooked. In many areas you can catch a brown on one cast and a rainbow on another. The Firehole is teeming with wild trout, but what you won’t catch are cutthroat trout native to the park. Above Firehole Falls, where we fish each year, the river was originally devoid of trout. In 1889 the government began stocking fish as part of a park-wide effort to draw more anglers to Yellowstone. The stocking program was a simple economic-based decision that had a detrimental impact on the native fish in many of the park’s waters. Stocking programs ceased in 1955 and now there is great emphasis on controlling non-native species and protecting the populations of native fish. Although the browns and rainbows in the Firehole aren’t native, they are wild and I’m glad they’re there. Maybe that’s selfish of me. The Firehole Rangers are creatures of habit, seldom (if ever) deviating from our long-established protocol. Truth be told, there’s little reason to change things up because we’re always rewarded with that which we seek. I must admit, though, I’ve always been curious about the fishing opportunities inside the Park beyond the Firehole. There are countless creeks, lakes and rivers that hold abundant fishing opportunities, so one may ask, “Hey, Firehole Rangers–why don’t you branch out and explore other areas?” That’s a valid question. 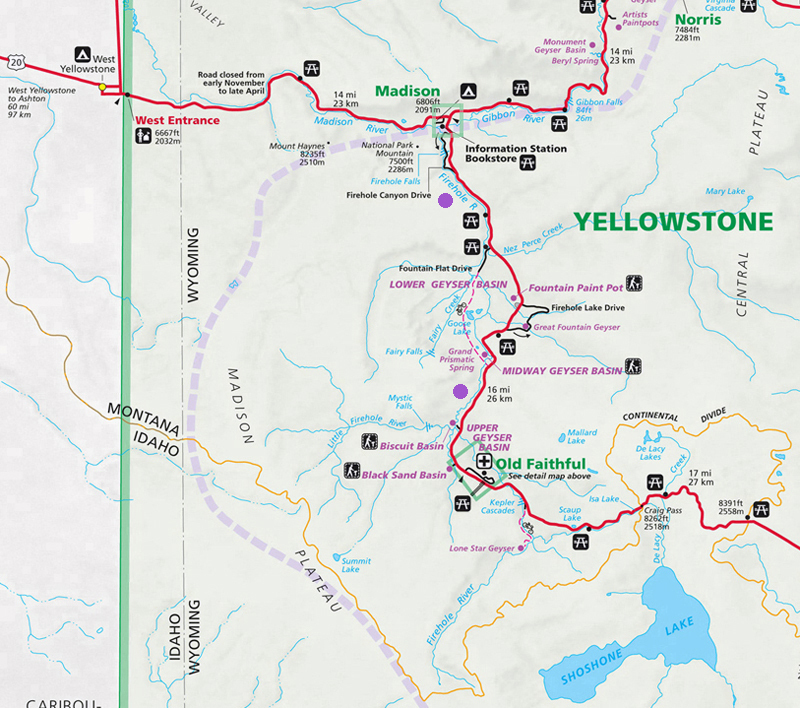 After all, Yellowstone is a vast expanse with a long list of rivers that beckon the angler: the Bechler, Firehole, Gallatin, Gardner, Gibbon, Lamar, Lewis, Madison, and Snake Rivers. The answer is simple: seasonal timing. Late May falls smack dab in the middle of the Spring runoff, and the other rivers in the park are all running high and off-color when we’re there to visit. The Firehole is unique in many aspects, not the least of which is that even when it’s running high, it’s fishable. It may turn a darker shade of tea, but it doesn’t muddy-up. And it’s a reasonably small river which can be crossed on foot in most sections, even when the river is high. Another reason for fishing the Firehole early in the season is that with all the thermal activity along its banks, the water temperature in river far exceeds that of other rivers in the park at this time of year. Through much of the area we fish, the temperature of the river is near 60 degrees and the trout activity is correspondingly elevated. As the season progresses and weather heats up, the Firehole can become too warm and unhealthy for the fish. Not while we’re there. Late Spring at 7200 ft does not necessarily equate to blue skies and fishing in shirtsleeves. Although it certainly can be nice, on most years we’ll find ourselves fishing in sporadically winter-like conditions. Last year it snowed hard all day on our second day, accumulating 5 inches of the white stuff. The weather is unpredictable, you can count on that. Two fly angling blogger types will be chosen to participate in his year’s Blogger Tour 2012. Those lucky two will spend three days in Yellowstone, learning about the impact of Yellowstone Lake’s invasive lake trout population and the Park’s native fish recovery plan. It’s a tremendous opportunity to learn about America’s first National Park (founded in 1872), and one of the most unique places on Earth. This is my submission for the Trout Unlimited, Simms, the Yellowstone Park Foundation and the Outdoor Blogger Network – Blogger Tour 2012 contest. Thanks for stopping by, Steve. It is a splendid tradition that I am privileged to be part of. Hurry with your post. I’ll point you to the exact rock to stand on. Great job Kirk. I enjoyed that a lot. Traditions like that can’t be beat. Why thank you, Howard–that may well be the nicest thing you’ve ever said to me (you must be losing your edge) 😉 It is a great tradition and definitely the highlight of my year. I hope to continue with the Firehole Rangers until I’m either too old to fish, or the volcano under Yellowstone lake blows its lid. Great post Kirk. I hope to make it up to the Firehole on opening weekend myself sometime in the near future. Great post. Wish you the best of luck! Best of luck to you as well, Paul. The Firehole is definitely worth a visit as early in the season as you can get there, before the fish wise up. No doubt a large part of our success rate is due to the fact the fish are hungry, and stupid on opening weekend. And we wouldn’t have it any other way 😉 Thanks for the comment. A tip of the cap to the Firehole Rangers. Sounds like a fine tradition to me. Do you accept guest rangers from the east? The Rangers are always open to newcomers (who buy the first round). Hurry–get yourself to the Ho Hum on Friday the 25th! Ah, that I could. Such things need more than two weeks runway. Next year, perhaps. Thanks for the offer! And when I do make it, the first round is definitely on me. You are preaching to the choir, Emily. We were actually hoping for a low snowpack/low water year so we might spike out and fish other waters, but alas tis not the case. It’s better this way, anyways, for everything except the Rangers. But we’re happy to stick with the old Firehole. She’s always very good to us. A fine tradition indeed. The Firehole Rangers sound like quite the crew, a motley bunch of miscreants to be sure, but a fine crew to carry tradition with. And I suppose since you don’t fish other water for good reasons during your time between the Ho Hum and crushing deer with the taco, the name wouldn’t be as symbolic. Friends, fish, laughs, and a beautiful place spend time in. Doesn’t get much better than that. Good luck in your quest to fish the park later in the season…hopefully the other Rangers understand. Thanks, Sanders. I think it’s safe to assume that come late July I’ll not be in Yellowstone, but it was fun to enter the contest just the same. I think I’m good for a TU membership and YPF hat though, simply because I got my entry in early 😉 I think you’d enjoy the company of the Rangers- we drink cheap beer. You should join us next year, if you’re not doing hanging drywall or something like that. You had me at cheap beer, and the potential to miss the annual hanging of new drywall…and to hang out with official Rangers. It just keeps getting better…I’m in! Kirk- great entry. Who knows, maybe we’ll get to explore the park together while hissing at the lake trout. I may have just jinxed my entry. What we should do some time is get a bunch of bloggers together and just do a freelance trip to Yellowstone. There are a lot of good folks I’d like to meet in person and fish with, including yourself. We could have all sorts of fun. Thanks for the comment. I’m in! Hopefully the “good folks” you refer to wouldn’t mind me tagging along. “good” is a relative term, Mike. Consider yourself officially tagging along. …I should have read further…assuming there would be cheap beer and at least one Ranger on the freelance trip, and still the opportunity to get out of the drywall business, I’d be in on this one too…didn’t mean to invite myself along. Invite yourself any time, Sanders. Ahh to live in road-trip proximity to the park. What a fantastic tradition. I hope you’re given the chance to enjoy the summertime experience. Good luck! Thanks, Matt. Honestly, I wouldn’t know what to do with myself in Yellowstone if there weren’t snow on the ground.